British-based Cromford Leather Company has created garments for some of the most well-known faces in film, but evidence of its expertise lies in its well-versed craft. The Keitel jacket by Cromford Leather Company is a classic bomber style. Photograph by James Munro. There’s a certain look that secret agents of the silver screen adopt, and it straddles the line between business and practical wear – inconspicuously dressed yet ready to dodge a bullet. These characters are also overwhelmingly sharp dressers, as a reflection of their equally sharp minds, and some of the most prestigious brands in the world have been recruited to put spies like James Bond in appropriate garb: Turnbull & Asser has provided shirts and ties; Tom Ford and Brunello Cucinelli have crafted sharp suits; and for hard-wearing leather, of course, there’s none more appropriate than British-based Cromford Leather Company. In 1997’s Tomorrow Never Dies, for example, the leather experts created a brown collared jacket with bellows pockets and a belt, which Bond paired with khaki trousers and a rifle. For Brad Pitt’s character in 2016's Allied, the house crafted a simple, wide-collared leather zip-up, which the intelligence officer wore with a shirt and tie. And in 2017's Kingsman: The Golden Circle, Colin Firth’s signature look was comprised of a cowboy hat, pinstripe suit, eye-patch glasses and a tan shearling coat, specially-made by the London-based brand. There’s good reason Cromford Leather has been trusted to create such pieces, as a brand whose values epitomise the best of artisanal craftsmanship. It was founded as the General Leather Company in 1971, by Savile Row-trained Alan Sprooles and Peter Goodall. Starting out as a mail-order business making made-to-measure suede trousers, it soon expanded into leather, suede and sheepskin jackets and coats. “Unlike now,” says Director Pauline Harris, “back in the 1970s there were numerous leather merchants in London, and Alan and Peter would trawl Leather Lane in Bermondsey to source quality skins in every colour of the rainbow.” The business initially grew through word of mouth, with the bespoke side blossoming through recommendations and celebrity endorsements. That leather also needs to be handled by experienced artisans, who know their way around the complexities of cutting and stitching such a hardy yet impressionable material. Everything Cromford Leather produces is a culmination of decades of experience working with such materials, from the design to the tailoring and manufacturing methods. The brand is also staunchly against mass-production, choosing instead to hand-make all its pieces in London to ensure quality is uncompromised. As a testament to this anti-fast fashion sentiment, Cromford Leather also offers alterations and repairs for leather, suede and shearling garments – including the replacement of zips or ripped panels, relining and resizing. Although Cromford Leather doesn’t do mass, it does do ready-to-wear, creating considered garments designed to withstand everyday wear, while upholding those all-important values. There’s the Hoffman, which is a take on the safari jacket, fit with front flap pockets and crafted from a buttery-soft lambskin. 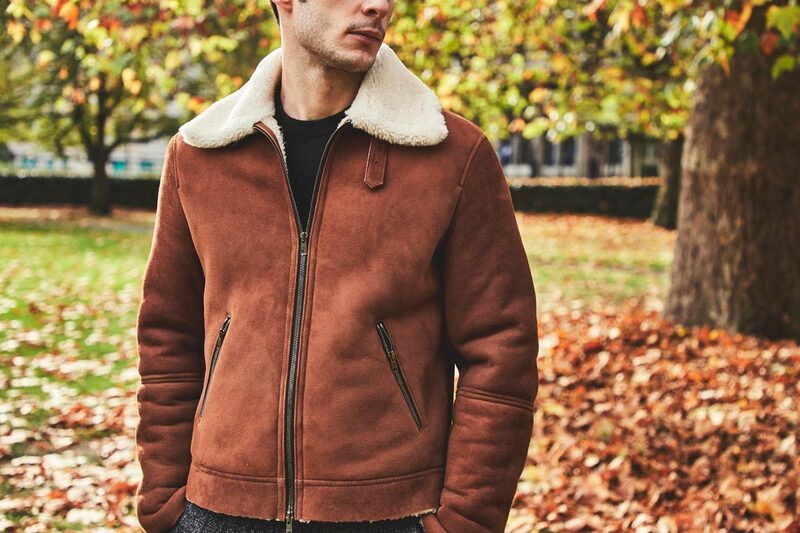 There’s also the Douglas, which is inspired by the Irvin flight jacket and is made from shearling attached to strong cowhide. Harris’ personal favourite is the Eastwood – a military-inspired coat with a double-breasted opening, brass buckles and epaulets, which is available in cowhide, sheepskin and suede. These ready-to-wear styles are evidence of Cromford Leather’s expertise and renown in the field of leather – they’re crafted with the same handmade care usually reserved for the highest-profile made-to-order customers. And while endorsements from spies and fellow British brands are nice affirmations, the tangible end result is all that really counts.